Yesterday morning found me standing at the kitchen sink washing the dishes that I had no energy to clean the previous night. After water splashed up onto my sweatshirt I glanced down and noticed an orange spot on the neckline. I looked around in the sink and couldn’t find anything orange that would have caused the stain and after another look at it I realized that it was already dried so it couldn’t have just happened as I was washing the dishes. That’s when it dawned on me. It was leftovers. The kind that don’t end up in a tupperware. After the kids were in bed I had plunked myself down on the couch and eaten the last teeny bite of pumpkin cobbler and obviously some of it had missed my mouth. I looked at that stain and had one of those moments. Those moments where you feel a shift in your spirit. I could take the time to go upstairs and change my shirt. Or I could just keep on wearing it, orange stain and all. You see, there was a time in my life where that stain would have really bothered me. When even if I wasn’t planning on wearing it out of the house I still would have been thinking about it all day. But in that moment, I just didn’t care. It wasn’t worth taking the time to go change. And after I had finished the dishes and moved onto other things I never gave that stain a second thought. Even when a friend dropped by later on in the day. It’s funny how certain things can take up unnecessary space in our minds or in our hearts. If it’s not pumpkin cobbler stains it might be something else. Like decorating mantels. I’m ashamed to admit it, but there have been times in my life where the prospect of an empty mantel waiting to be filled with seasonal decor has kept me awake at night. But, not this year. I’m not exactly sure when the ‘moment’ occurred but I know that it did because I felt that shift in my spirit. I just didn’t care as much about my mantel(s). Oh sure, I wanted them to look pretty and fall-ish. I knew that on my living room mantel I wanted to keep the beautiful painting done by my amazingly talented father-in-law. 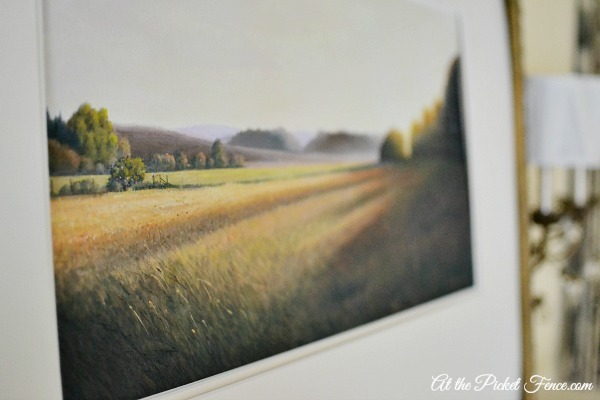 It’s called ‘Here Comes the Sun’ and it just so perfectly captures the beauty of the Willamette Valley especially during this time of the year. The ‘not caring’ as much about my mantel had some surprising results. Not only did it feel completely freeing, but I ended up liking this year’s mantel more than any I’ve ever done before. It took only minutes to do and once it was done I didn’t think about it again. The older I get the more of these ‘moments’ I seem to be having. These defining opportunities to choose what I will allow to dominate my mind. Don’t misunderstand me, it’s not that there’s anything wrong with giving a little bit of brain space to decorating. I gotta have me some decoratin’ zones in this head of mine! It’s just when it becomes consuming that we have a problem. When the time spent pondering proper pumpkin placement (say that 5 times fast!) is greater than the time spent pondering things of real value. Like how I can be praying for those who are hurting. And how God could use me to be a blessing to someone. Maybe how to finally work up the courage to step out into a new role. And, of course, how to spend more time with you here At the Picket Fence! 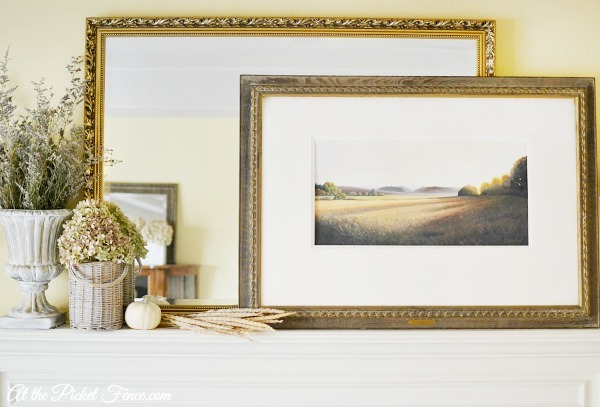 20 Comments on "My Other Fall Mantel"
so true. I spilled tea in my lap in the car the other day bringing kids to school and then to work out. after a 2 sec thought, never thought about it again. I love it, it’s understated elegance. 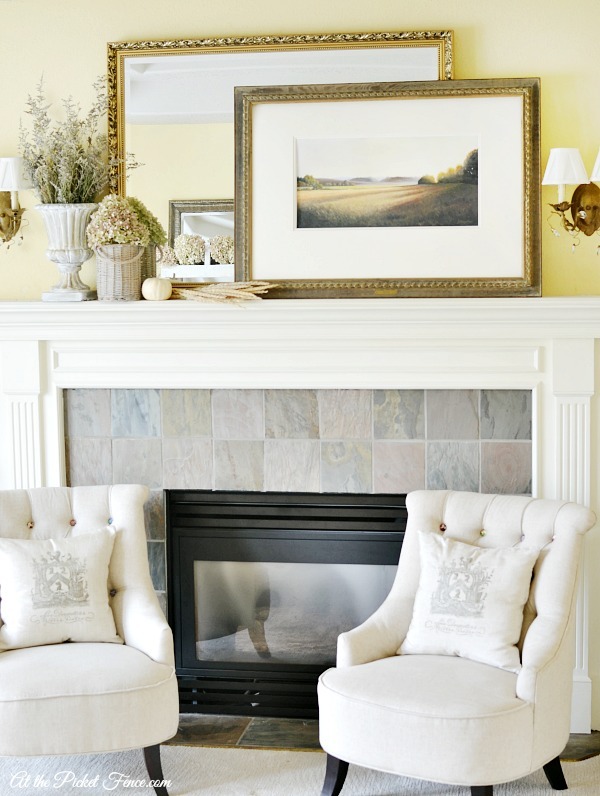 Love this post and your mantel is gorgeous! Have a great week. I completely agree Vanessa. This has been pressing on my spirit lately about what is more important; sharing about decor and projects or sharing God’s word. I try to do both by incorporating stories about my faith with my home projects with more emphasis on sharing God’s word. When I started our blog, I prayed over what our blog voice would be. Through prayer, it was determined that our blog voice would be determined by listening to His. Thank you for sharing and have a blessed day. I love that, Renee: Our blog voice is determined by listening to His. So so true! That’s exactly what our prayer has been too Renee! And that in all we do we would acknowledge and glorify Him. It’s such a blessing to have other like-minded bloggers to connect with and I so appreciate your words! I love what you said about being one of those women who have to fix everything. I was too and now that I am in my 60s I have realized that 90% of the time, whatever it is probably can wait. It might even wait until I go to heaven! So, I applaud you for realizing that fact at such a young age. I enjoy your photos and your thoughts!! Love the layers Vanessa—especially the mirror and picture! Vanessa – you have blessed me with this post! Happy Fall! The painting done by your father in law certainly deserves a place up front and centre. He really captured the beauty of the morning sun. 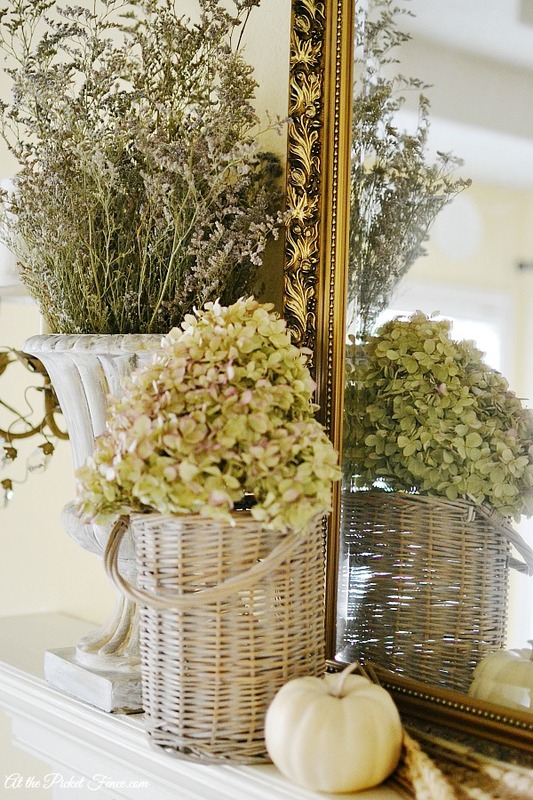 I love the simplicity of your mantel. There are times when some ” over decorate ” but you have got it just right. Beautiful post Vanessa! Orange stains and all 🙂 I think it was worth it, that cobbler sounded awesome! Your mantel looks lovely, Vanessa! 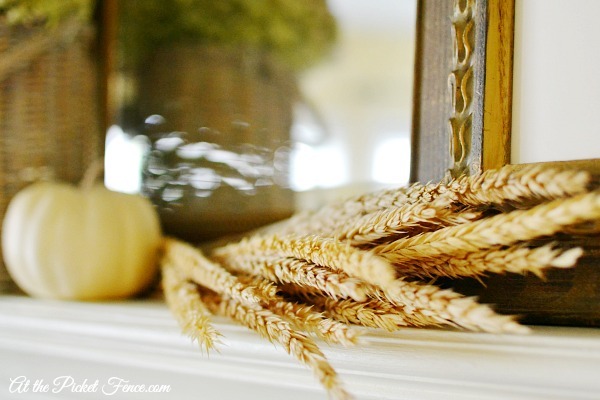 I love that painting and the sheaf of wheat. I love this message, Vanessa. As we get older, I think we do really put things in their proper perspective. And, as you found out, sometimes less obsessing over something brings the best results. That mantel is perfection! The painting is both sentimental and beautiful, and I absolutely love the urn filled with the white flowers. For the life of me, I can’t remember what those are called…it’s not statice, is it? At any rate…….gorgeous!! What a beautiful message in this post! Less worrying about the perfect decor, clothes, hair, etc. frees us to spend more time on the important things and the ones we love. Love how you’ve layered your father-in-law’s painting with the mirror! Just gorgeous! I love your attitude Vanessa…you are sending a great message to all of us….your mantel is perfection…filled with things that are special to “you” and not just for others…your father in law is such a tremendously talented artist…his painting is amazing…such a family treasure to be enjoyed by all.